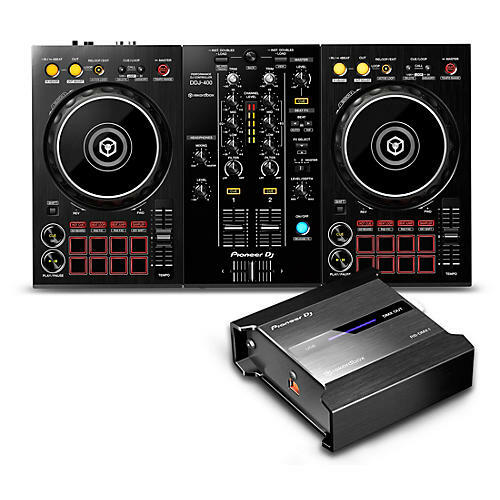 Designed for dedicated use with Pioneer's rekordbox dj software, the 2-channel DDJ-400 DJ controller offers the professional features and technology of larger controllers in a lightweight, portable package. The DDJ-400's compact form factor makes it simple to transport, and the included rekordbox dj license key and rekordbox dj tutorial feature will get you in the mix quickly, even if you've never tried your hand at DJing before. Although the DDJ-400 is more portable than its larger siblings, it still enjoys the same familiar club-style layout you'd find on Pioneer's flagship controllers, media players and mixers. Everything is exactly where it should be, from the onboard Beat FX to the looping controls to the 3-band EQ knobs. Designed to seamlessly integrate with Pioneer's rekordbox dj professional software, this dedicated DMX interface adds a new level of lighting sophistication to your DJ gigs. The RB-DMX1 is bundled with a license key for rekordbox dj, so you can start setting things up right out of the box. Working hand-in-hand with Lighting mode in rekordbox dj version 5.2 and higher, the RB-DMX1 lets you effortlessly synchronize DMX lights with your music during a performance. Using the advanced phrase analysis algorithm in rekordbox dj, Lighting mode automatically creates exciting lighting sequences in sync with the tracks in your rekordbox dj library, drastically reducing pre-performance preparation time. With the RB-DMX1, the information generated in Lighting mode can be sent to any lighting fixture that supports DMX512 protocol.